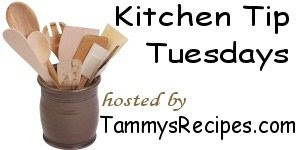 Click the pic to check out other great kitchen tips over at Tammy's Recipes. I have two kitchen tips for this week. First we live on the lake and do quite a bit of fishing. I am not fond of the fishy hands smell, so we keep a tube of toothpaste (thanks to CVS freebies) on the kitchen sink. Washing with toothpaste after washing with soap leaves your hands minty fresh without the fish smell. It works with other strong odors like garlic and onion as well. Second, try baking muffins in a cake pan. I've recently started doing this and it works great. A double batch works well in a 9x13 cake pan, while a single batch works best in a 9x9. This works great as you can bake a bunch at one time without the hassle of greasing muffin tins. We all love the muffin squares! Great tip, I have never thought of that before. I will have to try that. Thanks. I love the idea of making muffins in a cake pan! My family would LOVE it! I've done something similar, I put the muffin mix in bread pans. Muffins are good no matter what shape they are. Great toothpaste tip. I love the smell of Bubble gum toothpaste, now I'm putting a tube in the kitchen. I love the toothpaste tip!